Snakes have adorned humans since antiquity, their coils naturally forming rings, bracelets, necklaces, and armbands. While designs remained constant, the snake’s symbolism evolved over the last 6,000 years. In antiquity, serpents represented wisdom, eternity, and the form of a guardian spirit. Through much of the nineteenth-century they symbolized everlasting love, but by the fin-de-siècle they came to be seen as a symbol of sinister danger. In 1840 Albert presented Queen Victoria with an emerald-set engagement ring in the form of a snake biting its tail, a symbol of eternal love. At the time it was customary that an engagement ring feature the wearer’s birthstone. Symbols of love and romance were recurring themes in the jewelry Albert designed for her. A true romantic of her age, Queen Victoria’s love of symbolism made snake jewelry an enduring motif throughout her reign. 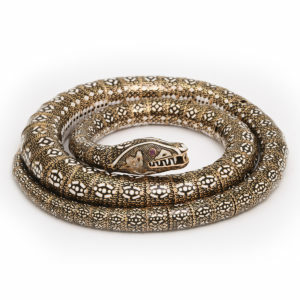 So precious was Prince Albert’s initial token of affection that Queen Victoria is buried with the ring that inspired a renewed fashion for serpents.